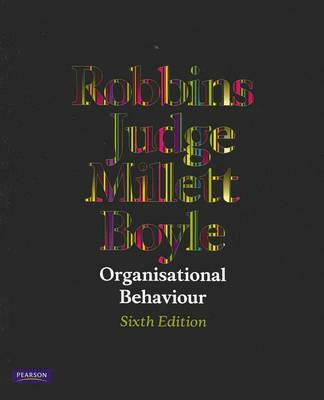 Robbins, Millett, Boyle and Judge provide you with cutting edge content, compelling pedagogy and expositional clarity. Organisational Behaviour, 6e maintains its position as Australia’s most popular teaching and learning resource for introductory courses in organisational behaviour. Renowned for its straightforward writing style, this text fully engages students with case applications and an extensive variety of questions and exercises. Its three-level model analysis (the individual, the group and the organisation system) prepares students to explain and predict behaviour in any company. Including leading edge Australian and international research, such as virtual teams and deviance in the workplace, the new edition is enhanced by the addition of a new author with expertise in these topics and emerging research on moods and emotions. Organisational Behaviour, 6e provides an unparalleled student and lecturer resource package and continues to define the standards that others try to emulate.